10" x 8" Prints Available Now! The curators at Tiny Showcase have selected one of my favorite paintings, "Expedition" for this week's showcase. About "Expedition": This painting was built up slowly with layers of translucent washes. 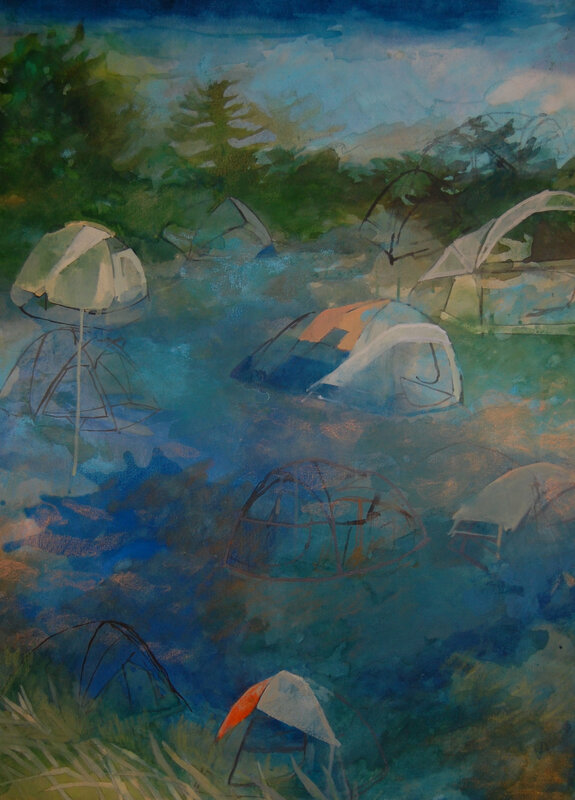 Illustrations of the zippered shelters that dot Midwestern shores were then painted onto the 40" by 30" canvas. This work is a tribute to the experience of floating through a wild and open landscape. Print Details: “Expedition” is a limited edition of 100 prints. Sized to fit a standard 10” x 8” frame, the artwork measures approximately 9” high by 6.5” wide. The archival print was created by Tiny Showcase and ships with a corresponding certificate of authenticity. The archival artwork has been printed on a heavy 290gsm natural white print making paper made from 90% bamboo fibres and 10% cotton. $250 from the sale of the showcase will be donated to Friends of the Boundary Waters Wilderness. Through advocacy and education, the Friends of the Boundary Waters Wilderness works to protect, preserve and restore the wilderness character of the Boundary Waters Canoe Area Wilderness and Quetico-Superior ecosystem. Prints are only $25, a perfect holiday gift or a treat for yourself!